50 years ago this week, the world stood on the brink of nuclear war as the Cuban Missile Crisis unfolded. 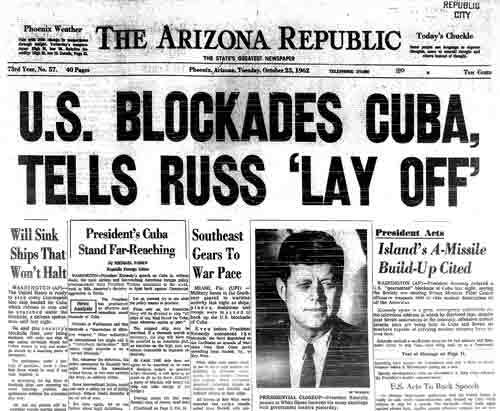 The United States finally decided to first blockade rather than immediately attack Cuba to prevent the Soviet Union from finishing installation of missiles that could reach the continental United States. This article introduces the little-known story of the battles between the “hawks” and the “doves” in the Kennedy Administration as related in a new publication, The Joint Chiefs of Staff and National Policy, Vol. 8, 1961-1964. When President John F. Kennedy finally announced the naval blockade of Cuba and the reasons for it on national television, Americans huddled together, practiced nuclear drills, and prayed for some peaceful solution to prevent all-out nuclear war. Only decades later did the full story of brinkmanship, bravado and brilliance come out about what really happened behind the scenes during those two weeks. A little known side of the story comes from the top military commanders who were serving the Kennedy administration during the crisis, found in the surprisingly fascinating book titled The Joint Chiefs of Staff and National Policy, Vol. 8, 1961-1964, from the Office of Joint History of the Joint Chiefs of Staff. This accounting of the Joint Chiefs of Staff during this tumultuous period in the history of American foreign affairs goes beyond the normal third party historian’s post mortem, since the author was actually able to meet with several members of the joint chiefs in the 1970’s to add more of their personal insights, including Admiral Arleigh Burke, Admiral George Anderson, General Lyman Lemnitzer, Chairman during 1960-1962, and the Chairman who succeeded him, General Maxwell D. Taylor. What results is an interesting amalgam of history and a peek into the tensions between military joint chiefs and the civilians to whom they reported. Describing the relationship of the Kennedy administration and the military establishment, author Walter S. Poole says: “During 1961-1962, relations between the JCS and their civilian superiors were often awkward and even confrontational” particularly between Secretary of Defense Robert S. McNamara and Lemnitzer. In 1962, the Soviet Union was losing the arms race with the United States. In late April 1962, Soviet Premier Nikita Khrushchev conceived the idea of placing intermediate-range missiles in Cuba to double the Soviet strategic arsenal and provide a real deterrent to a potential U.S. attack against the Soviet Union from the Jupiter missiles the U.S. had just placed in Turkey. Ever since the failed Bay of Pigs invasion the previous year, Fidel Castro felt a second attack by the U.S. on Cuba was inevitable, so he agreed to host the missiles as protection. On October 15, 1962, the National Photographic Intelligence Center confirmed that secret reconnaissance photographs from an American U-2 spy plane flight the day before were finally able to definitively prove the suspicion that Soviet medium-range and intermediate-range ballistic missiles capable of hitting Atlanta, the Midwest, Washington, DC, and even Los Angeles and Seattle were indeed in place and in the process of being installed and ready in Cuba within days. 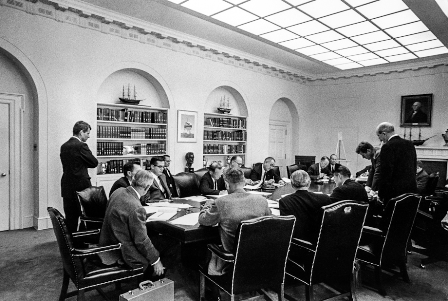 In response, President Kennedy and Secretary McNamara assembled the Executive Committee of the National Security Council call “ExComm” as a task force that, together with the Joint Chiefs of Staff and experts from the State Department and other intelligence agencies, would debate the United States’ options to deter the Soviets from nuclear escalation. To Blockade, Strike or Invade? However, as the crisis unfolded, the primary debate among the military commanders of the Joint Chiefs was over whether to carry out an all-inclusive attack against Soviet and Cuban forces on the island or a surgical strike confined to just attacking the missiles themselves, the nuclear storage sites, and Soviet MiG planes. 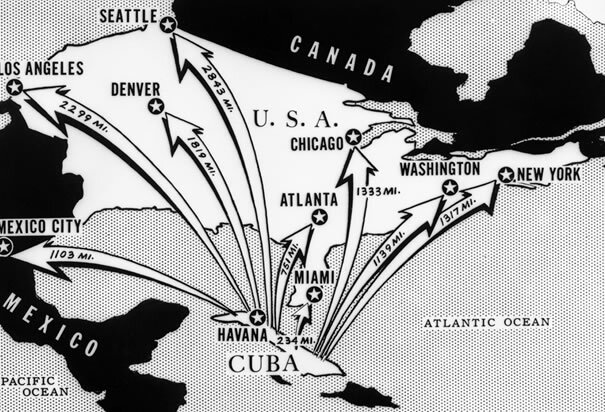 Both President Kennedy and McNamara thought that an all-inclusive attack would inevitably lead to invasion of Cuba, and then possible counter-attacks elsewhere by the Soviets or escalation to all-out war. But General Taylor reported that the Joint Chiefs and the combatant commanders felt “so strongly about the dangers inherent in [only] the limited strike that they would prefer taking no military action. They feel it’s opening up the United States to attacks which they can’t prevent, if we don’t take advantage of surprise.” Taylor added that his personal inclination was “all against invasion, but nonetheless trying to eliminate as effectively as possible every weapon [present in Cuba] that can strike the United States”. Even more fascinating was the story of the war gaming techniques used. To quickly develop two alternative scenarios for the President to consider, the ExComm task force split into two groups that constantly exchanged position papers and critiqued each other’s work. 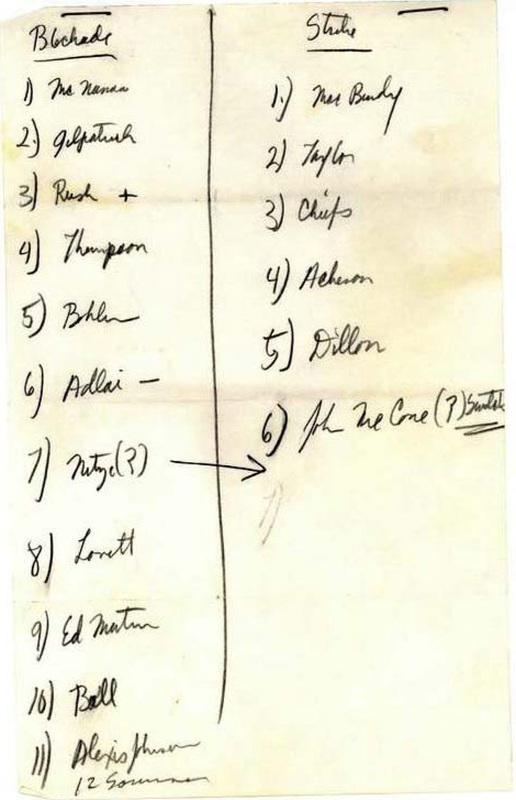 The “Blues,” who were to prepare the scenario for a surprise air strike, included General Maxwell Taylor, Robert Kennedy, Treasury Secretary Douglas Dillon, Director McCone, Dean Acheson, and McGeorge Bundy. The “Reds,” drafting the blockade option, included Chief of U.S. 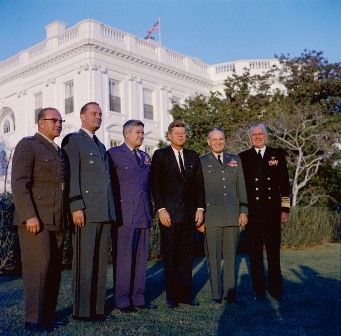 Naval Operations Adm. George Anderson, Marine Corps Commandant David Shoup, Secretary Rusk, Deputy Secretary Gilpatric, and Theodore Sorensen. In less than two days, two complete scenarios were prepared and presented to President Kennedy on October 20, with competing input coming from the Pentagon and the State Department. From this insider accounting of events, we learn that the Chairman thought that the probable sequence of events to be green-lighted would be: a political approach; a warning; air attack on the missile sites; blockade; and, if necessary, invasion, with the earliest air strike date set for October 21 (optimally the 23rd), and an invasion to begin on October 28. However, to find out exactly what happened and how the drama played out behind the scenes, pick up a copy of this fascinating book. HOW DO I OBTAIN “The Joint Chiefs of Staff and National Policy, Vol. 8, 1961-1964”? Find this and other Government publications about Cuba in our Cuba collection.